I got The Best Present Ever for Mothers Day this year. And that is saying a lot, because I was just showered with gifts this year. The girls’ handmade gifts and cards were almost as sweet as the big proud smiles on their faces when they gave them to me, of course, but J took the cake with one of his gifts. He organized my spice collection. Hopefully you feel the full effect of that sentence as I do: you should be bathed in light and joy as the heavens part and you hear the angels sing Alleluia. Are you with me? This is a big deal. Once upon a time, I had a few rows of spice jars tidily tucked into a spice rack. Later, the jars began to multiply and J put up shelves to hold more of them. But in recent years the spices had completely outgrown that expanded solution and they began to pile up in tiny bags, then handfuls of tiny bags stuffed into bigger bags, then finally gallon jars full of big and little bags that all were starting to smell like curry powder or cardamom. It was not a particularly efficient system. So it was with adoration that I approached my spice rack (it’s really more of a spice wall now) today when I decided to make this dish. Everything was in its place, alphabetically arranged–except for my assortment of chiles, which take up a shelf of their own. Bay, cardamom, cinnamon. Check, check, check. Cloves, coriander, cumin, right on down the line. It’s so easy when things are where they are supposed to be! This entry was posted in Asian Flavors, Food, My Favorite Recipes, Recipes and tagged cooking, dinner, food, homemade, Indian, kale, lifestyle, recipes, vegetarian on May 17, 2012 by emmycooks. I don’t have any whole spices, but I’ve been dying to make paneer, and I need more kale recipes. Thanks! You should definitely check out the paneer tutorial, after my success with this recipe I want to cook my way all the way through Kolpona Cuisine! Try the recipe with ground spices and tell us how it is–cook with what you have, make it easy, right? If you’re looking for kale recipes, allow me to recommend this salad, which I could eat all day: https://emmycooks.com/2012/04/20/kale-salad-with-apples-currants-and-gorgonzola/ If you’re not a blue cheese fan, you could sub goat cheese, feta, or even Parmesan, or leave it out entirely. That looks awesome! 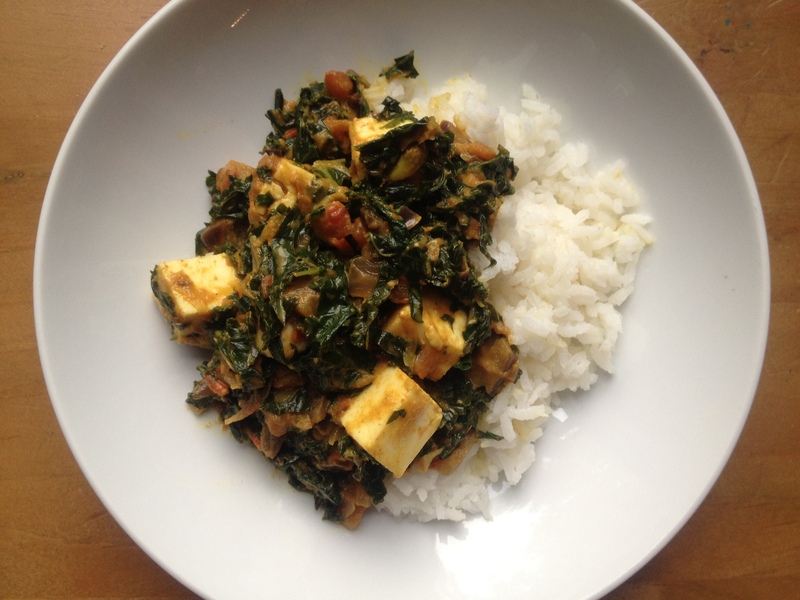 You and Daisy are rockin’ the Kale Paneer so you know what that means, I have to make some too. Back home, everything green (as in a green leafy) is called “saag” and spinach is called “palak” – whenever we cook any leafy green veggie….it’s a saag! I can’t wait to rock more of your recipes. You need to write a book. It would be brilliant! What a relief to hear that I’m not the only one with the drawer full of baggies of indeterminate spices! This looks great — can’t wait to try. Well, actually, now you ARE the only one. :) But I can send J over with a zillion empty jam jars if you like, he’s a spice-organizing pro now! Looks amazing, Emmy! I thought how Tahmina instructed us to use whole spices was just brilliant too. When she writes a cookbook, I will be one of the first to buy it! I like how you added the water tablespoon by tablespoon. I will do that next time! I was being careful because of your good advice–thank you! This sounds really good, and I’m very jealous of your newly-organised spice rack! Well, it’s just about the only thing that’s organized around here, so don’t be too jealous. :) But I do love it! Sounds delicious… but…. I am lactose intolerent… some cheeses are OK in very little quantity… what would you suggest replacing the cream with? Almond milk mixed with a tiny bit of flour to keep it from separating. Works great. Unless you can’t have any gluten then use chickpea flour (Besan). Thanks, Tahmina! Last time I tried making this I didn’t have cream or half & half and my resulting dish was really watery–next time I’ll try your milk+flour trick! And Xplorexpress, you could definitely use tofu here for a dairy-free dish–it wouldn’t be the same but it would be another good way to soak up these amazing flavors! Thank you, I will try that… I have chick pea/quinoa/millet/coconut/tapioca flours… so… have the choice. I have to make my own bread as I am allergic to gluten too and all processed foods. Not easy to go out for supper :) but, I consider it as a blessing as I have to eat healthy! Oh! May I ask you a question? My grand daughter have the same blessing as I :) but is also allergic to eggs… what would you suggest for me to replace the 3 eggs in her favorite gluten free bread I make? What a great sub for the spinach! I LOOOOVE saag paneer, and I’m as pleased as you were with your spice organizing to have a new slide-out spice rack in my new kitchen. It’s AMAZING!! Enjoy! Oh, it’s still tiny, it’s just new! And I”m loving it. I’m hoping a friend of ours will give us his 1-year-old fridge when he moves to Ecuador at the end of the month. Fingers crossed! :) That will really be the icing on the cake! Kale and paneer- who would have thought? Sounds like an awesome combination.